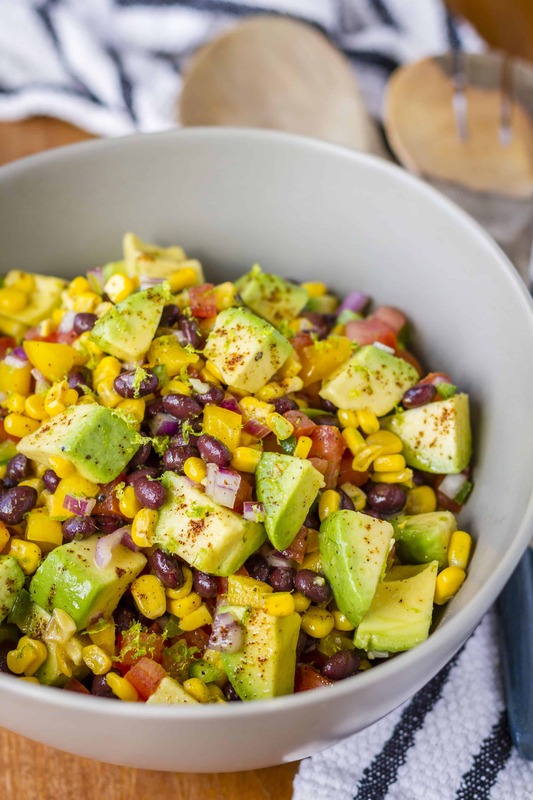 Dressed in a simple lime vinaigrette, this guacamole salad is a fantastic summer side dish… You’ll love the combination of creamy avocado, tangy lime, and spicy jalapeño, along with a good measure of sweet corn and black beans! My love of avocados has always run deep, but I gained an even greater appreciation for them during my recent experiment with the Whole30. If you’re not familiar, the basic principle of the Whole30 is to eat moderate portions of whole foods, including a serving of protein, veggies and healthy fats in every meal. Avocados are an excellent source of healthy fat and, as so, are a daily essential on the Whole30. Avocados, which are a fruit (although most people think of them as a vegetable), contain less than one gram of sugar per 1-ounce, the least amount of sugar per serving of any other fresh fruit. Avocado contributes nearly 20 vitamins, minerals and phytonutrients, making it a good choice to help meet nutrient needs. Avocados act as a “nutrient booster” by helping the body to better absorb fat-soluble nutrients, such as alpha- and beta-carotene and lutein, from foods that are eaten with the fruit. Though I’m not at all above eating an avocado straight, with just a drizzle of lime juice + some salt and pepper, one of my all-time favorite avocado recipes is this guacamole salad. I first shared it way back in 2011 when I started blogging, so I figured now is as good a time as any to freshen up my photos a bit and re-share it with you all! Just look at this gorgeous array of ingredients — talk about a rainbow of flavors! 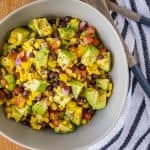 Corn and black beans aren’t something I’d normally include in guacamole, but they’re a terrific addition to a guacamole salad, adding sweetness and protein. You’ll need to put your chef’s knife to work, because lots of slicing and dicing goes into this salad. However, I assure you it’s all worth it. 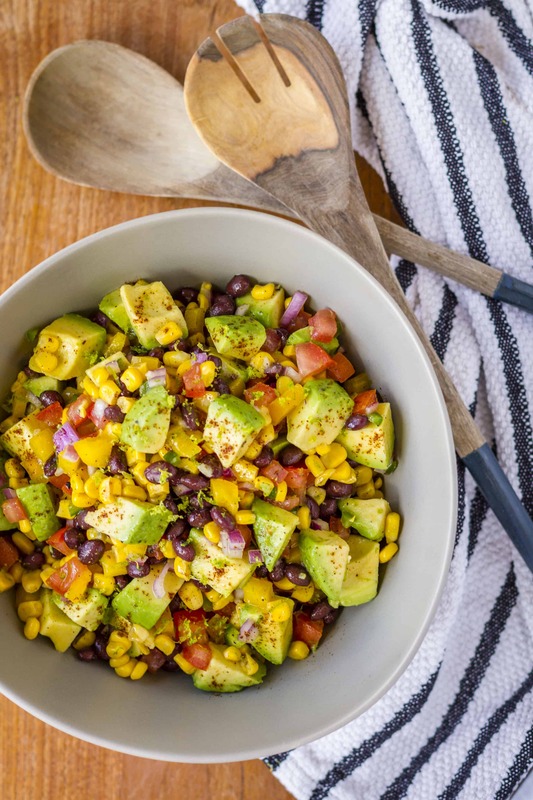 NOTE: If you want to use this recipe for a Whole30, you’ll need to omit the corn and black beans to stay compliant. But it’s still delicious without them! 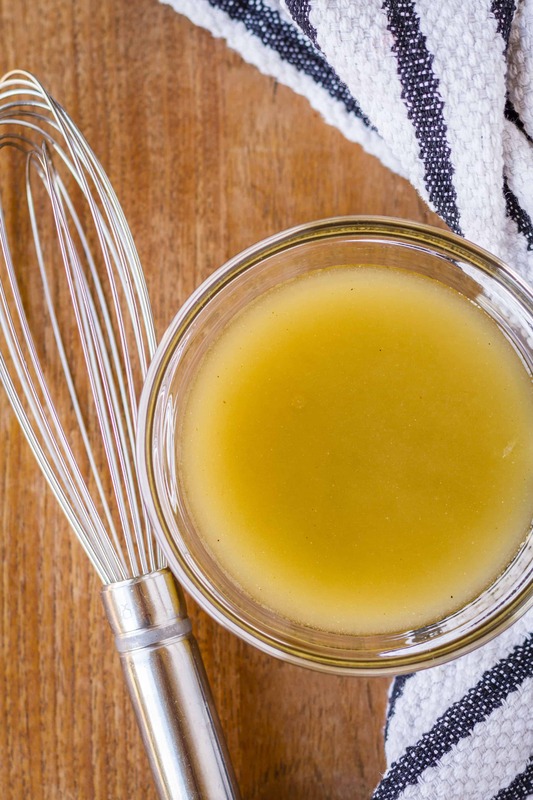 The dressing is just a simple lime vinaigrette. I opted to use avocado oil in mine, but extra-virgin olive oil would work equally well. Whisk together the lime juice and zest, salt, pepper, garlic, and chili powder, and then slowly drizzle the oil in while whisking vigorously. Pour the salad dressing over your chopped veggies, toss well, and refrigerate for at least an hour to let the flavors marinate. I recommend waiting until you’re ready to serve to add the avocado, as it will start to break down some. Or you can use a slightly underripe avocado, and it will hold up to the dressing better. This guacamole salad is just as tasty the next day — but I’d say it’s much prettier when it’s freshly made. If it so happens that you’re lucky enough to have leftovers, it’s the perfect light lunch when used in a lettuce wrap! 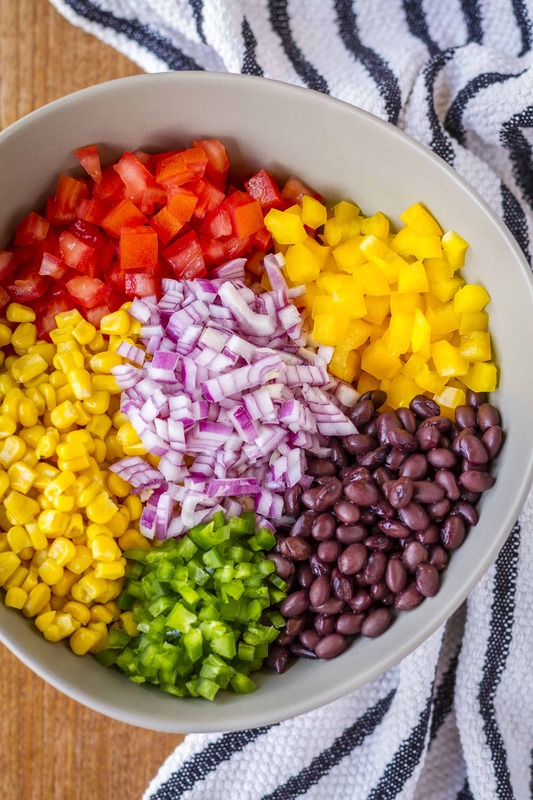 Add the tomato, yellow bell pepper, black beans, corn, red onions, and jalapeno to a large bowl. In another bowl, whisk together the lime juice, salt, pepper, garlic, and chili powder, and then slowly drizzle in your oil of choice while whisking vigorously. Pour the vinaigrette over the salad and gently combine. Fold in the lime zest. Refrigerate for about one hour to let the flavors come together. Fold in the diced avocados immediately before serving. Learn how you can incorporate more avocados into your diet. 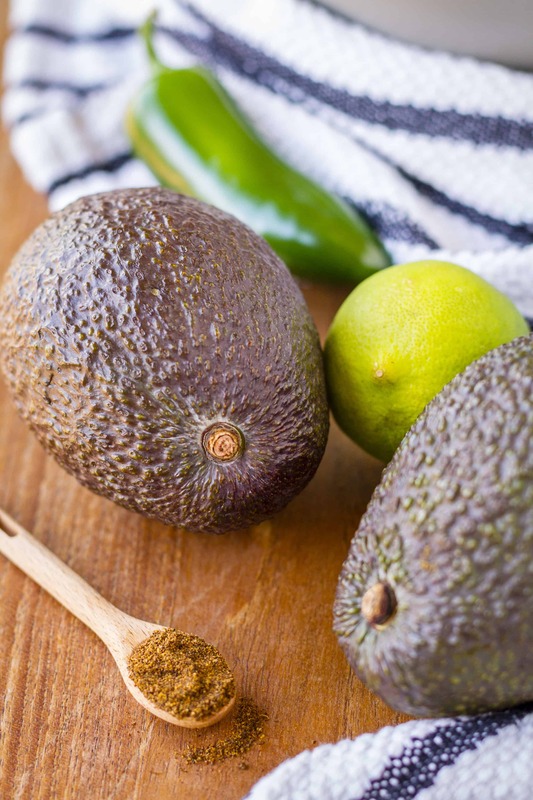 Visit the Hass Avocado Board website for more avocado recipes and nutrition facts! great idea for healthy dinner! Wow! Colors are so beautiful in this dish, I can’t wait to try this recipe. I have been meaning to make this for awhile now and finally got around to it. I did add the cilantro, like you suggested. My family and I love this salad. This is going to be on the regular rotation at our house. Thanks for posting it. Oh, wonderful! I actually haven’t had a chance to make it again since posting this. Glad to hear the cilantro works well in it, and I can’t wait to try it with it! The photos are amazing! Looks fantastic! Looks great! I am going to make this for a get-together on Sunday! I do plan on omitting most of the salt (on a low-sodium diet) and adding in chopped cilantro! Look’s great, can’t wait to try it. We make something similar to this but add in hominy instead of corn. This looks so refreshing and bright and perfect for spring and Cinco de Mayo next week!